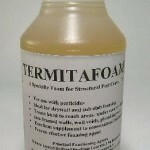 PRODUCT DESCRIPTION: Additive needed to create foam for use in foaming tool. RATE OF APPLICATION: Add 2-4 ounces of Foaming Agent to each gallon of finished spray you want to convert to foam. RELATED PRODUCTS: 2 GALLON FOAMER 2 GALLON FOAMER w/SLAB 12" INJECTOR FOAMER SLAB INJECTOR 12"
It might. Its hard to say because the products we use it for in the pest control industry require very little concentrate added to the mix. And the foaming tool is a big part of the process. So if you won't be using the foaming tool and if you have to mix something at a high rate like 8 or more oz per gallon of water, I doubt it. In our industry, the mix rate is usually 1 oz per gallon or less so the chemical components won't interfere. And of course, the foaming tool has a big part to do with the end result. I guess what I'm saying is its anyone guess. I do know some people have purchased it for odd uses here and there but I don't ever recall if it helped them because I don't remember getting feedback afterwards. Sorry we can't be of more help.